The Department of Driver Services (DDS) print “LIMITED-TERM’ on Georgia driver’s licenses (DL) and identification cards (ID) issued to customers who are not United States citizens but who have presented documentation proving that they are lawfully present in the United States. These customers will include lawful permanent residents, students studying from abroad who establish residency in Georgia, individuals working temporarily in Georgia and the dependents of such individuals. The DL’s and ID cards issued to these customers will be valid for the period of each customer’s approved length of stay in the country up to a maximum of five (5) years. 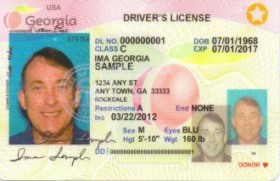 Although marked as “LIMITED-TERM,” these cards grant the same privileges as regular Georgia driver’s licenses, permits and ID cards. In addition to having their lawful status in the U.S. verified, Non-Citizen drivers must meet all other requirements to be licensed to drive in Georgia and all Non-Citizen customers must provide documents to prove identity, residency and registration with the Social Security Administration. Please note that cards marked as "LIMITED-TERM" cannot be used to verify citizenship for voting purposes. Please check with the Secretary of State's office and/or the Secretary of State's Website for additional information. The “LIMITED-TERM” cards will have the same security features and appearance as other Georgia DL/ID cards. The only difference between “LIMITED-TERM” cards and the cards issued to United States citizens will be the inclusion of the words “LIMITED-TERM”. The LIMITED-TERM cards should be accepted for activities, such as banking, car rental and shopping, which require a DL or ID just like other Georgia cards. A Georgia DL/ID is not proof of lawful status in the U.S. so it is important to note that an expired LIMITED-TERM card does not mean the person is in the country illegally. The marking of Limited Term is one of many enhancements being introduced with DDS’ Secure ID program. For more information about Secure ID, please visit https://dds.georgia.gov/SecureId.